Hey, hey! I have a fun boy themed layout for you today for The Cut Shoppe! For my layout today I started by cutting the POW portion from the Hero Up Cut File on a scrap piece of pattern paper to use as a mask. I then sprayed Gold Heidi Swapp Color Shine onto the white cardstock. After the Color Shine was dry I added hand stitching using black embroidery floss to let the starburst and letters pop! 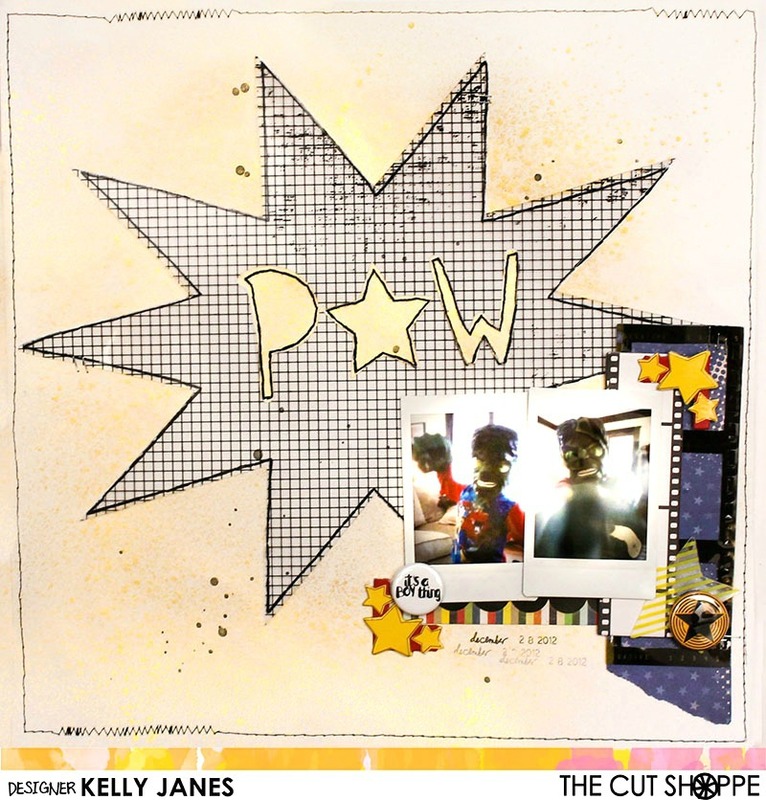 After the stitching was complete I cut the POW portion of the cut file again on a transparency to add a little more visual interest to the layout. Here you can really see the shine from the Color Shine!! Love it! I then started working on my photo cluster. I have been on a serious scrappy stash bust lately! I’ve been buying all the things from the new collections that are being released and I’m feeling a smidge guilty about the stash I’ve been hoarding collecting. I think after a few more layouts using older products I’ll feel better about all of the shopping I’ve been doing recently! HA! The pattern paper is from an older CTMH collection, Super Heroes, but all of the other products have lost their labels. I did add a couple flair buttons. The “It’s a boy thing” is from Feed Your Craft and I believe the star flair is from A Flair For Buttons? I’ve put together a video so you can watch the process. The video also contains a Cricut Design Space tutorial. 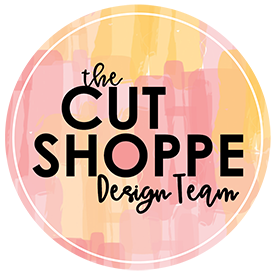 Thanks for stopping by and don’t forget to check out The Cut Shoppe for all of the fun cut files that are available! New files are added every other Thursday! !